SEW EUROPE only supplies machines complete, built up and sewing. Unlike some other company's, we are not a 'Box Shifter' and do not expect you to have to assemble your own machine. Your satisfaction is very important to us and our reputation is your guarantee. 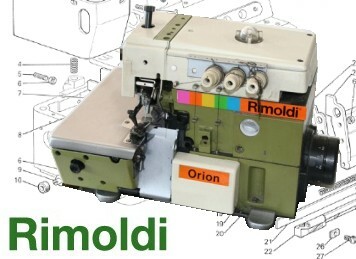 Rimoldi B27 227 327 427 527 & Orion High Speed High Quality Range of Overlock Machines. Manufactured in Milan, Italy. A very successful range of overlockers until manufacture ceased several years ago. SERVICE PARTS & ACCESSORIES are available from us for these Machines. Internal Parts are now becoming very difficult to source, but we would be happy to try to supply what you need. Call Us Today with your requirement or check out the Parts Books Below which will help you identify what you need. Need Help or Advice? Unsure of exactly what you need? Or can't see your parts here? Please Call one of our Engineers who will be delighted to help.